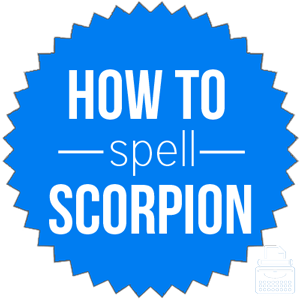 Spelling of Scorpion: Scorpion is spelled s-c-o-r-p-i-o-n. Definition of Scorpion: A scorpion is a small creature of nocturnal arachnids with a long curved tail terminating in a stinger, many of which are venomous. A scorpion is also the symbol for the astrological sign and constellation, Scorpio. What does scorpion mean? A scorpion is a terrestrial creature of the arachnid family with pincers like a lobster and a poisonous stinger at the end of its jointed tail. Most types of scorpions live in tropical and subtropical places. Scorpions are predatory arachnids with eight legs. There are approximately 1,750 known species of scorpion. Scorpion, of course, is a noun. At first glance, he thought it was a spider but the locals informed him that it was, indeed, a scorpion. Luckily, this type of scorpion is not as deadly as the Deathstalker Scorpion, but we still need to get you to a hospital. As mentioned above, a scorpion is also the symbol for the zodiac sign, Scorpio, and the constellation Scorpius. The Zodiac Scorpio is not only represented by a Scorpion but a Phoenix and an Eagle, also. A scorpion is a symbol for the constellation, Scorpius, which is associated with the story of Orion in Greek mythology. According to Merriam-Webster’s, scorpion was first used in the 12th century. Scorpion is believed to have originated from Middle English between 1175 and 1225 A.D. from the Old French word eskorpiun, or perhaps from the Italian word scorpione, both of which come from the Latin word scorpio(n-). Ultimately the word comes from Greek’s skorpios, meaning scorpion. Since it is the name of a specific thing—an animal—there are no synonyms that can replace scorpion. Scorpion is a noun that refers to a small animal of the arachnid family that has pincers and a venomous stinger. A scorpion is also the representative sign of the zodiac and constellation, Scorpio.